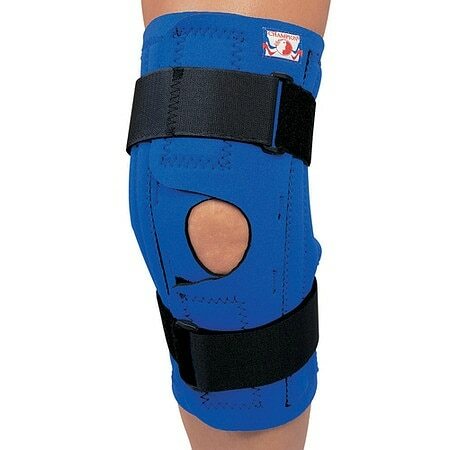 Champion Professional Neoprene Knee Stabilizer Wrap with Spiral Stays Blue1.0 ea. Opens flat for easy application over injured, swollen or tender knees. Spiral stays provide moderate medial/lateral stability, yet flex and extend naturally with the joint. Opening over back of knee minimizes binding, provides additional wearing comfort. How to Measure: Measure around the bend of the knee. X-small - knee 12.0-13.0 in. Small - knee 13.0-14.0 in. Medium - knee 14.0-15.0 in. Large - knee 15.0-16.0 in. X-large - knee 16.0-17.0 in. 2X-large - knee 17.0-18.0 in. 3X-large - knee 18.0-19.0 in. 4X-large - knee 19.0-20.0 in.